If your child is a fan of Disney’s Frozen she will love this Disney Frozen Singing Traditions Elsa Doll. Disclosure: I received this toy in exchange for this post. Contains affiliate links. 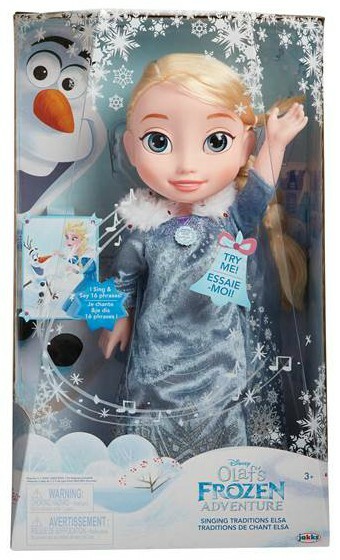 New from Jakks Pacific, this doll will help your child pretend they are in the Frozen world all the time. She is based of the new animated short Olaf’s Frozen Adventure which shows before the movie Coco. Raise Elsa’s left arm and you can sing along as she sings the new feature song, “When We’re Together!” Even cooler, her dress magically lights up to the music. How cool is that. I know my 4 year old is going to find that amazing. Elsa’s new dress has glittery details and a snowflake cape with a faux fur collar. She really looks like she lives in a frozen castle. Elsa can say 16 phrases and is approximately 14″ tall. Her hair is in a braid of course. Elsa requires 3 AAA batteries to work but guess what… they are included! Recommended for ages 3-6. My daughter will be carrying her everywhere after the holidays. She’s also the same size as other dolls she owns so we might have a Elsa, Batgirl and Doc McStuffins party. She is available at Walmart, Target, Amazon, Toys R Us and more.